A new video has got the band very angry. We explain Matty's twitter rant in full. Last night (May 22nd) saw mop-haired Mancunian and The 1975 frontman Matty Healy take to Twitter for an epic rant of near-Kanye proportions against the UK government. Why? Let's back up a second and explain. ICYMI, the UK is currently debating whether or not they should stay within the European Union, a REALLY complicated process that will result in a public vote at the end of June. This debate is known as "The Brexit" (British Exit). 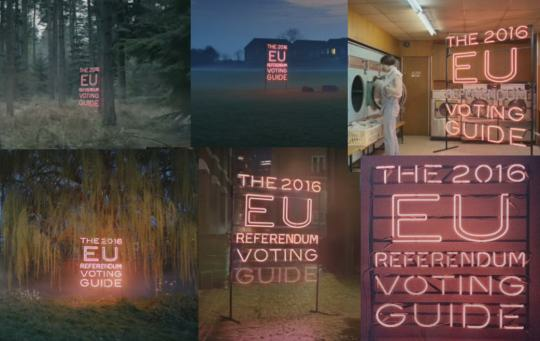 Yep, it looks like the government have been taking some inspiration from The 1975's imagery used in their recent album campaign shot by David Drake. Cut to Sunday night and the band's manager Jamie Oborne discovered an accompanying promotional video for the government that again uses the exact aesthetic from the album. Even worse, the campaign promo was directed by Nadia Marquad Otzen of Academy Films, who previously directed the band's "Settle Down" video. Safe to say, Matty was upset. But, while many fans have been on side with the band, there have been a few dissenting voices who feel Matty has little right to complain. To think that the inventor of neon went forward in time to steal the idea from the bloke from the 1975. Disgusting. No one can use neon ever again. It's banned. Matty from The 1975 owns it all now. Surely though there is a difference between simply using Neon lights and using the exact same imagery as the band? The video is extraordinarily similar to the exact colour scheme and filmic style The 1975 have been using and developing since the end of 2015. Plus the director's past connection to the band would dispel any assumption that she had simply never heard of the group. Academy films have yet to comment on the situation. What do you guys think? Is the video too similar to The 1975 or is it just a coincidence?